We are all being challenged to let go of our default setting right now. If you had told me as a kid that when I grew up I would be working in sometimes packed Spiritualist churches giving messages of hope and inspiration, I would never have believed you. My imagination just wouldn't stretch that far. It felt really scary to step out into the unknown, all alone (or so I thought) I was too much of a shrinking violet! Shy and retiring is my default setting, although you may not think so now; I would literally hide behind my mum’s skirts as she tried to coax me out of my shell. When I was a young teenager at secondary school, I was asked to read something out during school assembly. It felt like the biggest jump I had made to that date! It was an honour so I accepted, but of course was petrified; plain and simple, and shook dreadfully. My church mouse squeak barely reached the front of the stage let alone the back of the hall: stage fright, big time. At the end of Assembly, I was left alone to make the long lonely walk back to the classroom, and not one member of staff offered me any word of encouragement. I felt a complete failure. I always had a problem taking centre stage after that. This same scenario kept playing out in my life, and somehow I could never imagine things any different. That was the problem; the way I looked at it! When I started teaching I was asked to play piano for school assembly. This time my fingers froze over the keyboard, and all I could manage were random notes. I will never forget the headmaster’s face as he tried to keep the children singing! My thoughts zero-ed in on how stupid I must have looked! Later still, I froze in front of an eminent Spiritualist medium at a training college. Absolutely nothing came out of my mouth but I swear you could hear my knees knocking and again I got not one word of advice or support. That's when I very nearly gave up altogether! Once again all I could think of was how ridiculous I must have looked in front of the main man. It took me a while before I realised life was exactly that: a series of ‘Big Jumps’ into the unknown, there was nothing I could do to about that, but I could change the way I saw these challenges. And the way I saw things could really turn my life around. Even though I wasn't getting the support I needed in the outside world, 'things' were going on behind the negative thought forms that had gathered in my head. Blue skies were always there, they never deserted me. Even when I couldn't find them in the grey sky of my imagination my connection to the Angels was always there to guide me. Even though 'shy and retiring' was my default setting from childhood, I didn't have to revert back to the old patterning: none of us do. Did you realise positive change has also been factored in our BEING from the moment we are conceived? We are meant to grow in our understanding. 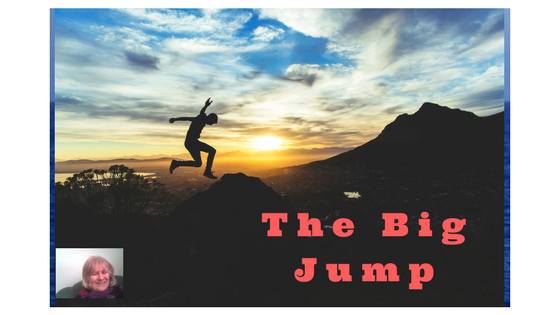 The point of life here on earth is to take that Big Jump out into the world, to free ourselves from our fears and limitations. It's just that we resist change often imagining the worse. To be fair, much of that resistance is based on our sometimes traumatic experiences of life, real or imagined, especially as tiny children. The biggest fear we carry into our adult life from childhood is that we are going to be abandoned or rejected: all support and love withdrawn, just for being ourselves. But the Big Jump is part of our collective destiny. It is a real Leap of Faith. We all have to jump out of the prescribed mould into no man's land to become the individuals we are meant to become. We are not meant to be pale imitations of anyone else, we are truly meant to be ourselves and are literally set to go 'where no-one has been before' as I have blogged before. My own Big Jump came when I realised I was looking in the wrong place for the support I needed. It could never be found in the outside world, but that the Angels were always there to help us take that leap of Faith, even when we couldn't see them, and even when we weren't quite sure where on earth we were going to land. The Man of the Moment is Archangel Michael, who has been really present over the eclipse corridor from start to finish. 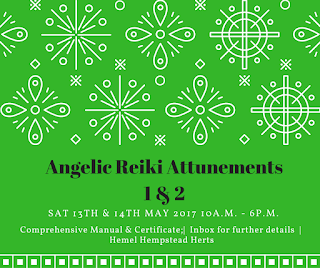 Over the weekend I have been running an Angelic Reiki Attunement course, and we were all very aware of his presence. His task is to help us surrender to this very moment, and to live a life founded on love rather than fear, knowing we all do have a place in this world. without exception. Over the years I have got to know Archangel Michael, my relationship with him has grown and grown. He remains a true warrior for the Divinity but his presence has become increasingly nurturing and loving. Although christened Michael, I feel that he is neither masculine or feminine, even though his name may suggest otherwise. His warrior-like energy is associated with cutting the ties that bind us to the past, whilst the more feminine side of Michael nurtures and protects us after we've made the Big Jump forward. His is the energy encouraging us to rest for a while, and take stock rather than bash on forward as we take our first baby steps into a bright new dawn. Love is the Breakout Call! The relationship you have with yourself is perhaps the most important one in your life. Its the basis for the life you lead. Do you see yourself separate from Source energy, in which case you may spend a lot of time ducking and diving to avoid 'certain' catastrophe, or do you understand that you have a part of that Source energy deep within your Being? You have a destiny to fulfil, and the Angels and Spirit are not going to let you down. Love is not to be found outside of us, but deep within our hearts, and an Angelic Hug is designed to reconnect us to our True Feelings 'Unconditional Love' We literally are unconditional love! And those blue skies above you are just waiting for you to take flight! Knowing who you are beyond the labels you've acquired in this lifetime, is the key which unlocks the next stage in global consciousness. It's the key to realising, we really are all on the same side, even though we may all have such different ideas about life. The names we attach to things may be different but underneath we are all one. Love is our breakout call. As I continue to work with Michael I am told how important it is to 'look out onto the world with loving, rather than fearful eyes' and even though we can't see the final outcome to imagine the blue skies shining way up high beyond the dark clouds of our imaginations, and to make that our new default setting. Blue is not only a very healing colour, it is associated with Archangel Michael himself.